Today’s network is moving toward carrier-neutral facilities to help manage large amounts of traffic and data. In many cases, organizations are adapting to hybrid cloud environments. 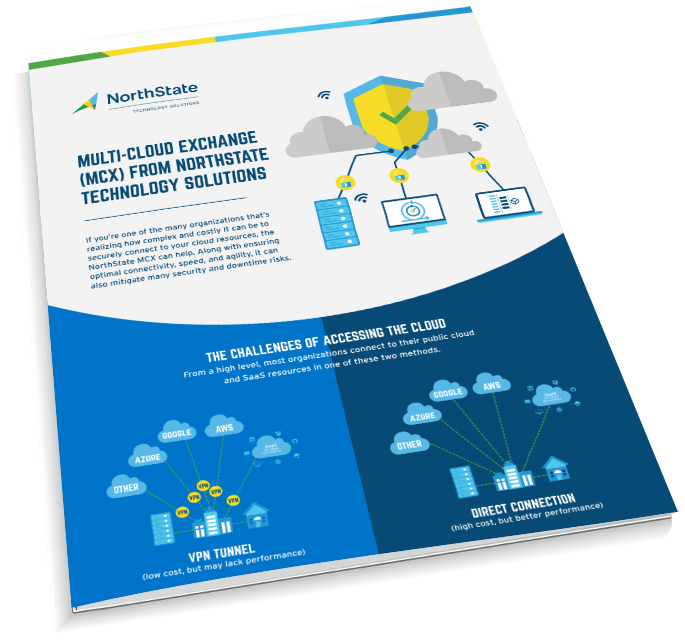 The NorthState Multi-Cloud Exchange (MCX) supports multiple cloud providers across the same subscribed bandwidth, including Google, Amazon, and Azure. Our solution lets you manage users and apps across cloud environments – private, hybrid, public, or colocation facilities – cutting costs and creating a positive user experience. Your organization gains the flexibility to move workloads or enhance services through a direct connection to colocation and as-a-service offerings. By maintaining a secure and consistent presence, your organization is positioned to be more nimble and responsive than the competition. Simply share your contact information and our associates will be in contact to answer your questions and discuss how NorthState may benefit you. NorthState Technology Solutions provides technology assurance secure, reliable technology that businesses can count on with client-specific IT and data center solutions. In order to enable businesses to stay ahead of the challenges associated with digital transformation, NorthState Technology Solutions offers secure IT, managed and professional services. Supported by SSAE 16 audited state-of-the-art data centers with hybrid and multi-cloud solution support, NorthState Technology Solutions offers a 24/7 support team to serve its clients.